My friend Lauren really likes pumpkin bread. Or so she says. I've never actually seen her a room with pumpkin bread. So I told her I'd make some. And then about 10 minutes later, I realized it would be hard to give to her, and pumpkin bread is so much tastier (in my opinion) in the morning. And I usually see her in the afternoons. But I was determined to get a pumpkin cookie down. So I turned to the banana-oatmeal cookies I've made far too many times. Because if they work for bananas, why not pumpkin? It turned out to be harder than I thought. The first few batches, while tasty, nobody could ever identify the pumpkin in them. By batch 4 or 5, I'd found the secret. Ginger and toasted pecans. For some reason, the ginger and pecan flavor is reminiscent of fall and pumpkins. Or maybe I'm just crazy. Either way, you should try these cookies. Did I mention they're also super easy? Preheat oven to 350ºF and line a baking sheet with parchment paper or a silicone baking mat. In a small bowl, whisk together the flour, baking powder, baking soda, cinnamon, ginger, nutmeg, and salt. Set aside. In a large bowl, whisk together the oil, sugars, and pumpkin puree until smooth. Whisk in egg and vanilla extract. Stir in flour mixture. 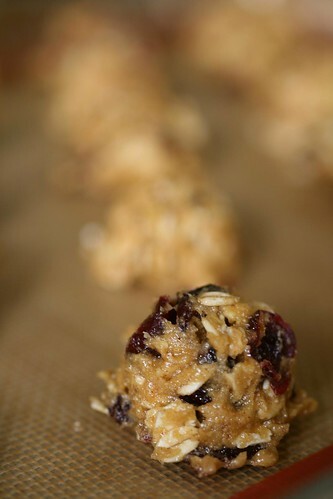 Stir in the oats, pecans, dried cranberries, and white chocolate.